When you go to the homepage you get a fairly simple interface, with a colour scheme already there. You can click “Generate” to select a new one. You can click on an individual colour and adjust it. You can lock a colour to remain in the next set when you generate. You can move a colour to a different position in the palette. You can give the generator perameters to start with too, like picking and locking the first colour, the first and last colours, and so on. There are other functions, like seeing the palette applied to a landing page..
…but I mostly use it for generating random palettes. And then of course the next step is swatch my markers. I like to pick a darker shade for each colour as well, for adding shading. In this case I ended up with a mix of brands, nearly all the brands I own actually. If you’ve been around for a while, you know that there’s a big craft show nearby that me and my friend Cayden like to go to called Make It. It’s actually two combined shows called Make It, and Knit & Stitch It, but it’s a whole lot easier to refer to it as Make It. We didn’t go last year because the event was changing to a new venue that wasn’t quite built on time, and so it was cancelled. Naturally we were very excited to go this year. We booked our tickets, booked an Encaustic Art workshop with Kazie’s Magical Designs, and we booked a Macrame Bracelet workshop with Riverside Beads. We saved lots of pennies to spend. We were all set. Then a week before, Cayden had a minor traffic accident and has a badly bruised ankle. He’s fine, but that much walking wouldn’t have been good. We waited a few days to see how quickly he’d heal, but it didn’t look like an option. So we took advantage of Amazon Prime overnight delivery, ordered ourselves some supplies, and we had our own little workshop. We ended up buying paracord, because it’s something we’ve both wanted to use, but paracord bracelets are made using knotting and braiding, which is essentially what macrame is, so it all counts. We used a whole bunch of sources online but we mostly used YouTube tutorials from the fantastic Bored Paracord, The Weavers of Eternity, and Everyday Knife Guy. Everyday Knife Guy actually has a three part Intro to Paracord series that we followed. Lots of really good information. The second video shows some basic knots: snake knot, barrel/noose/sliding knot and a celtic button knot. The third video shows how to make some little fobs. We watched, pausing and restarting, pausing and restarting, whilst watching Project Runway. We have no fashion sense whatsoever, but we love Heidi and Tim. The first thing we did, which you can probably guess from the horrendous tension, was the Snake Knot. The second one was a square knot, which was relatively easy for me because I use the same kind of layering in my origami bows. The third was a version of that knot, but with the direction of knotting changed, which makes it a rounded spiral. Very pretty. We looked for tutorials for a paracord bracelet and found this one by Bored Paracord. It was fun to do – and used the button knot which we’d learned with the second video by Everyday Knife Guy. The actual bracelet part is super simple – it’s just a wrap. I didn’t completely cut off the excess of mine (that’s the bit I’m attempting hide with my hand), because I wanted to test it’s quick deploy-ability. It really does just pull apart. And then I got to remake it. Bonus fun! After that we searched for some actual macrame bracelet tutorials, since that’s what the originally planned workshop was, and we found this one. 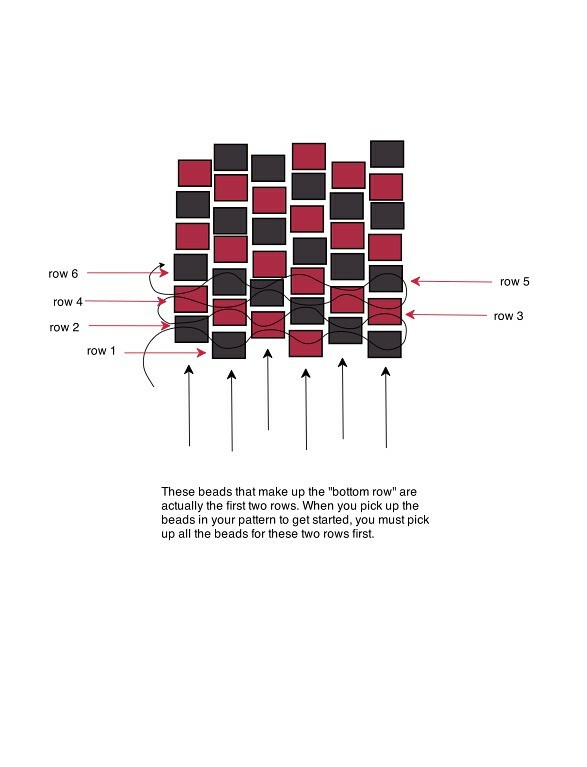 It uses a square stitch, not to be confused with a square knot. A simple stitch I’d tried in the past. And the clasp is just a couple of square stitches over both ends. We looked for more macrame videos and found this one by Sarah G.
She demonstrates in terms of wall hangings, which we didn’t get into but probably will soon, but the knots were interesting to learn. Especially the Right Twisting Half Square Knot – which is what it sounds like. Just half of the square stitch, repeated. Which makes this really awesome spiral. It was a really good session. We learned lots, and did lots. And I’ve been doing more knotting since. Mostly just repeating stuff, and muttering to myself to remember which steps to take. It’s kinda soothing. I will definitely be doing more of these. I want to try a wall hanging at some point, and I want to try with thinner cord. I’m also working on a long hanging piece that demonstrates all the knots/stitches I’ve learned. Before I decided to learn to draw, my 2D art consisted of zentangles. I love zentangles, they’re theraputic and pretty. But something I never did was shade them. I couldn’t get to grips with the shading, so I just avoided it. The stark look is fine for zentangle pieces, though. I love the way my zentangle pieces look. When I was just doing colouring, I rarely did any shading there either. And I’m really happy with those pieces. But since I started the sketching, and the inking, and the colouring, I’ve learned a thing or two. Flat images are great. They look good. But when you some shading, you get a whole different effect. Shading is awesome. I shall do more. Makerly is a monthly craft subscription box and it’s been on my wishlist forever. Now that I’m not super super broke, I’ve set up a subscription. I did get a one off box for Christmas, and that’s sitting on my desk waiting for me to get round to it. …it was heavy and had a vague wafting scent which intrigued me. When I opened the package there was an allergen notice, which doesn’t affect me specifically but I love that Makerly included it. Under that was the welcome leaflet, and confetti. You gotta love confetti. I’ve never made bath bombs. I don’t use them, and the craft just never appealed to me. But having a kit right in front of me, I was excited to try. And so the box did not get relegated to my to-do pile. Makerly includes a full page, detailed, colour instruction page, with photographs for each step. Inside the pretty pink tissue paper is a set of different ingredients, all clearly labelled – and some in very cool spotty bags. As well as the things needed for the bath bombs there were a couple of shiny freebies. Step one: combine all the white powders into a … well a bigger white powder. Step two: pour out oils. This was a little tougher than you’d think because the bottles had those droplet lids, but it was still easily done. Step three: add the dye. This was where I encountered my first issues. The lid of one of the bottles cracked and dyed my fingers, and then the dyes were water based and didn’t properly combine with the oils. Step four: dye the powders. The instructions never actually told me to split the powder into two bowls, but I read between the lines. Step five: don’t add too much. I did hear quite a lot of fizz, so I was a little concerned. But I managed to get to the clumpy consistency. 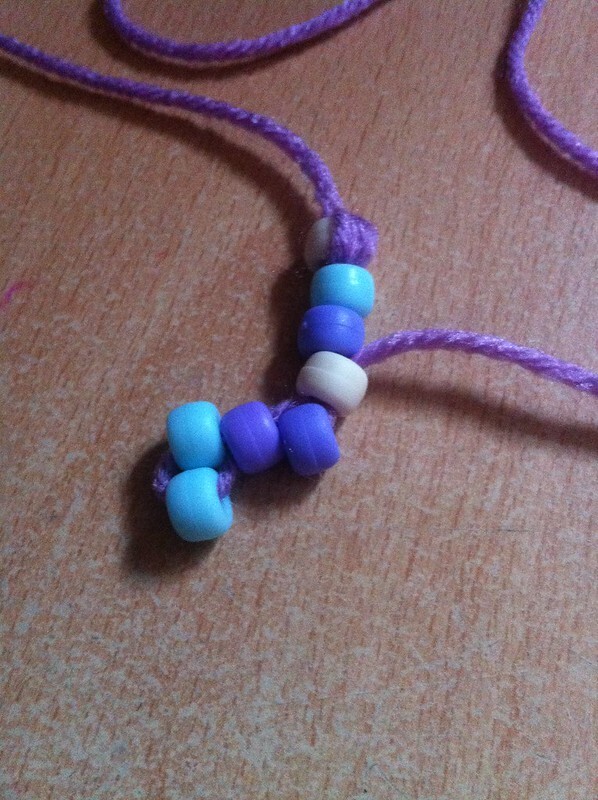 Step six: combine the two colours – which should be pink and blue, to make a purple. My pink was more of a purple, and my combination was a purpley blue. But I had three colours, which was fine. Step seven: the smushing! Smush, layer and add confetti. Step eight: rub the two hemispheres together until you can close the mould. Step nine: pray to the crafting gods, and remove the mould. Step ten: repeat for balls two and three. Step eleven (not in actual instructions): run out of powder before you complete the 4th ball, scoop up what’s dribbled out during the rubbing of the hemispheres, barely manage to squeeze enough in, but successfully create a 4th bath bomb. I put my little balls aside to set for 24 hours, and got on with clean up. Which was really easy, given that I’d done everything on the pretty pink tissue paper. There was a small puddle of powder from a little tear, and a tiny oily smudge. But clean up was super quick and super simple. 24 hours later… well, more like 48 because I forgot about them. Um, yeah. They kinda collapsed. They’d sort of moulded into the plate. And together. All except this half, which solidified itself to the plate. I could not pry it off. So I ended up just putting the whole plate in the bath. The good news is that it was very fizzy, and it fully fizzed. There was no residue or anything. And it smelled awesome. I don’t think I’ll be making any more bath bombs, but I’m really glad I had the chance to try them out. They’re really cute. The kit was just about perfect. In the spirit of SaltECrafter, here are my cons and pros. Con 1 – the instructions didn’t tell me to get a second bowl. This is a really minor nitpicky issue though. Con 2 – the bottle cap split, but it wasn’t an issue of Makerly, or even the production. Both bottles were sturdy and secure, I think it was just a fluke. Con 3 – the dye didn’t properly mix with the oils, although the photographed image seemed to be fully mixed. Con 4 – the pink powder ended up more of a purple. Con 5 – the oil bottles were a little hard to pour out, but easy enough to squeeze. Con 6 – there was only one glove included. Con 7 – the balls collapsed, but I don’t know whether that was something I did or the kit. Pro 1 – there was the perfect amount of ingredients. No measuring, no leftovers beyond a dribble of oil. Pro 2 – the scents weren’t personally to my taste, but they were really nice. Pro 3 – the theme was awesome. Who doesn’t love a good galaxy? Pro 4 – the instructions were concise, clear and well photographed. In colour too. Pro 5 – shiny freebies, that fit the theme. Pro 6 – the allergen notice. As I said, it doesn’t affect me, but it will definitely affect some people out there. Pro 7 – the packaging. It was all very compact and cute. Pro 8 – the price. I don’t know how much a bath bomb kit costs, but the Makerly subscription box is £15 a month with free postage. It’s a good price, for a different craft every month. Pro 9 – everything you needed was there. You just need to provide spoons and bowls. And a bath. Overall I’m really happy with the kit, and the result. And I can’t recommend Makerly enough. You should definitely go check them out. I have a lot of ideas. Tons. I have a double page spread in my bullet journal of ideas for blog posts. Not to mention the dozens of folders on my computer of photos and notes for posts. But for some reason I just haven’t gotten around to them yet. I’m trying, I promise. And then today I’m catching up with my YouTube subscriptions and something pops up that I’ve been planning a post for. I’ve been working on it for almost a year. I did the research, did the shopping, waited for the deliveries, did the thing, took the photos, wrote the notes. And then it’s all sat in my Blog To Write folder and festered for about three months. So I’m hereby pledging to get that damn post up! I’m working on it. Like right now. I’m gonna publish this, then open a new post and start writing it. Disclaimer: This post is a repost from my old blog, which was more personal and less crafty. I don’t use that blog anymore, but thought I’d share some of the craft-related posts from there. This one was from March 2015. 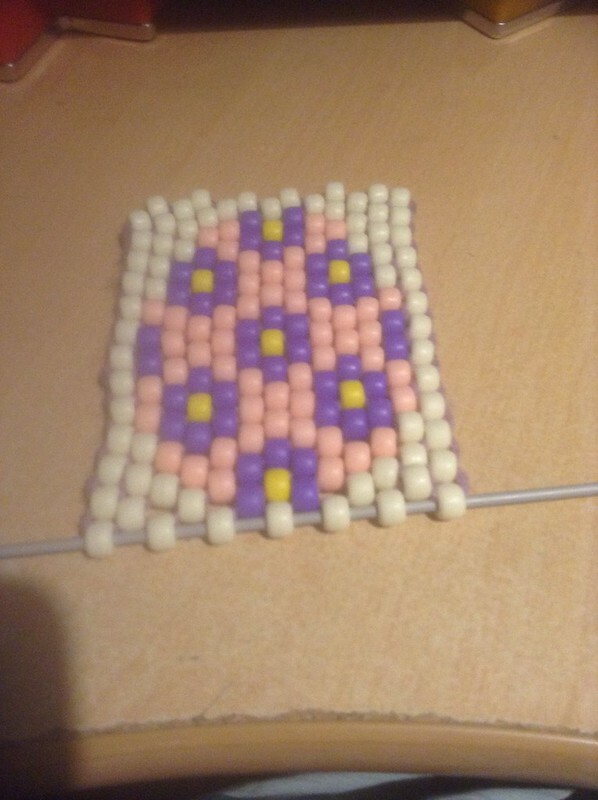 I’ve decided I’m going back to basics with beading. I still have to learn the various stitches to make proper beadwork pictures and things. 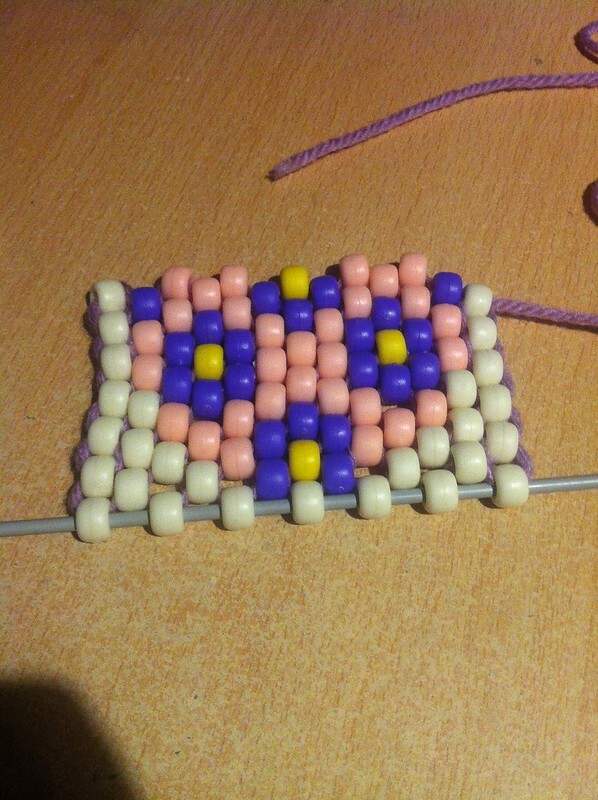 Starting with Peyote stitch. According to this website I’ve been learning from, the term comes from Native American cultures. There are three types to learn on that page. Flat Even Count, Flat Odd Count and Circular Flat. So I started at the beginning. Made a stop bead. Easy. What I couldn’t figure out from the instructions on that site was the finishing off. So I went to YouTube. (I love YouTube.) At which point I realised that it was essentially a case of weaving in the thread until it was secure. So, Flat Even mastered. To move on to Flat Odd, or to make something in Flat Even? 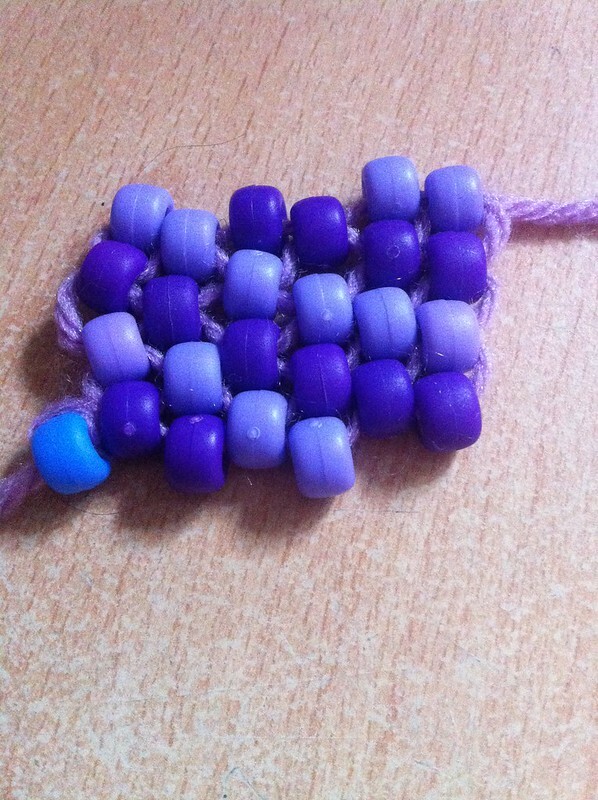 I went for making something in Flat Even – I decided a nice cuff in purples would be good. So off I went. 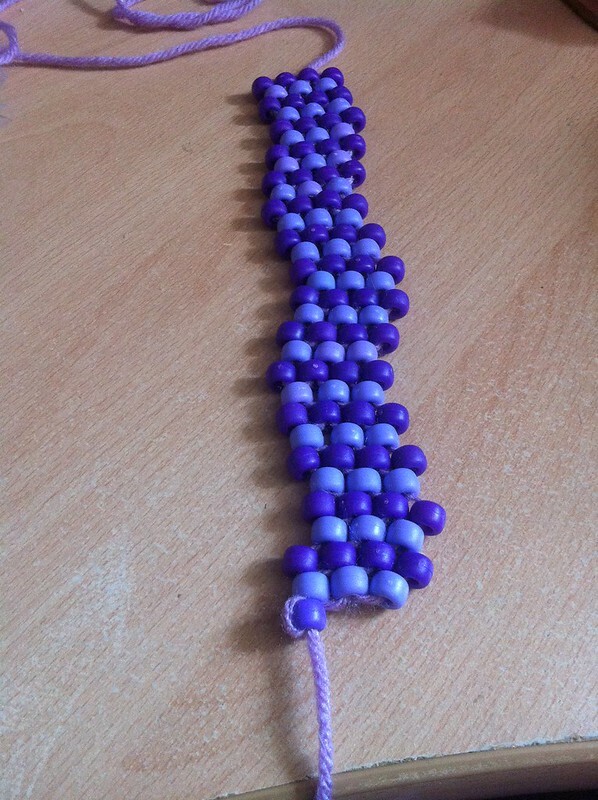 I realised with a bit of a “duh” moment that it’s called Flat EVEN because the number of beads in your initial row is an even number. 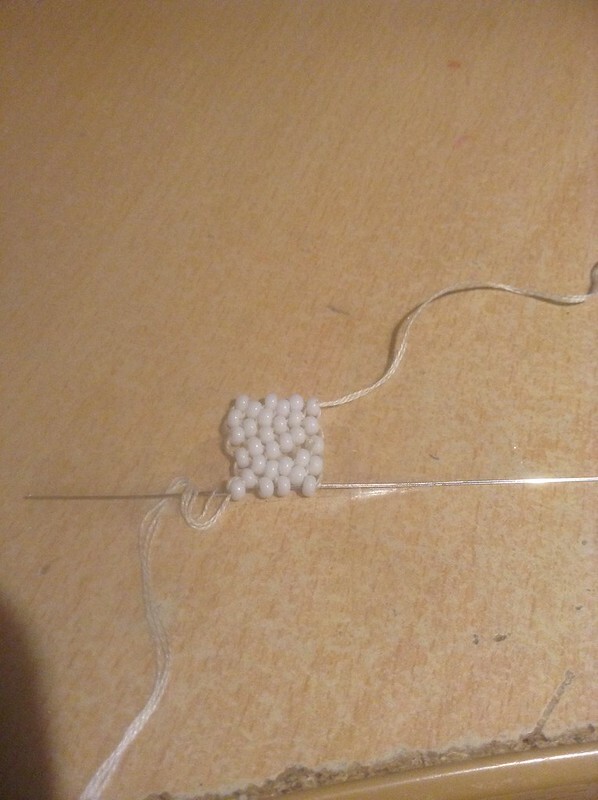 I also realised whilst working that it’s better to pull your thread taut after every bead, or every few beads, rather than at the end of a row. Especially if you’re doing a long row. The thread won’t pull through otherwise. And once I’d finished my few rows, I realised that when weaving your thread through to secure it, you shouldn’t pull too tight because it’ll warp the shape of your piece. I DID have a nice straight line to make a cuff. Now I have a wave. Next question – do I work on improving my Flat Even skills, including learning to follow a pattern, or do I move on? Well, I think that question is fairly obvious. I needed to follow a pattern. A quick google search lead me to this website, which had a nice diagonally striped pattern to do. 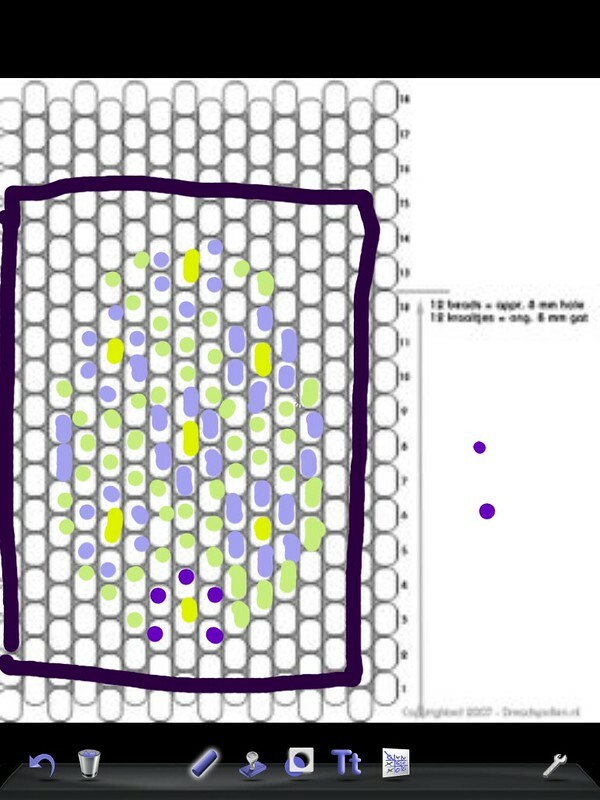 I figured out the pattern reading quite quickly, but I wasn’t entirely happy with my results. 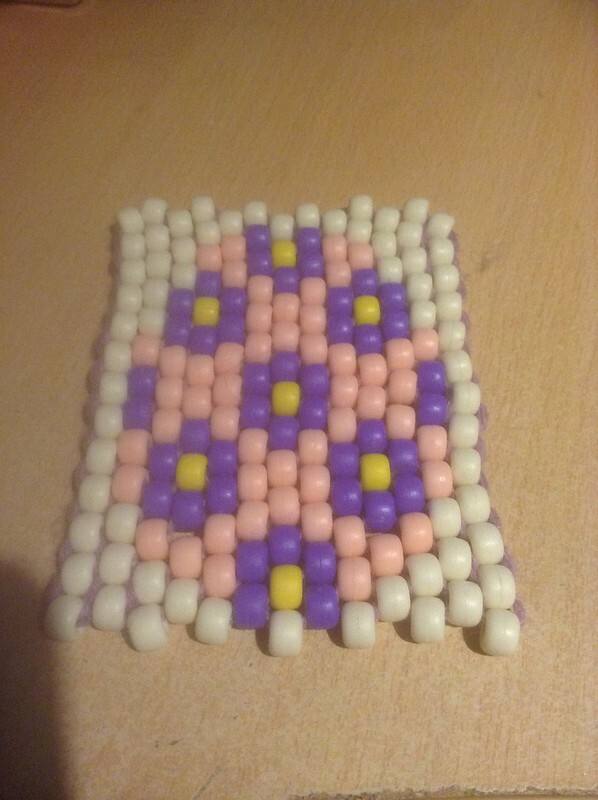 I decided it must be the pony beads, and that I was ready to work with the seed beads you generally use for what I have learned is called “bead weaving”. 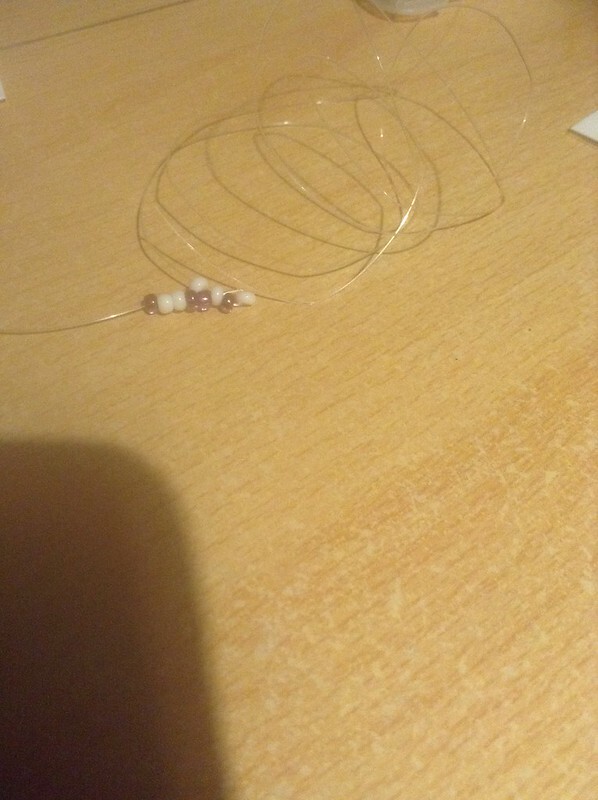 I dug out my seed beads, and some thread stuff that goes through them. And I just kinda got in a mess. The beads wouldn’t line up right. So I figured maybe I’d gone too small. 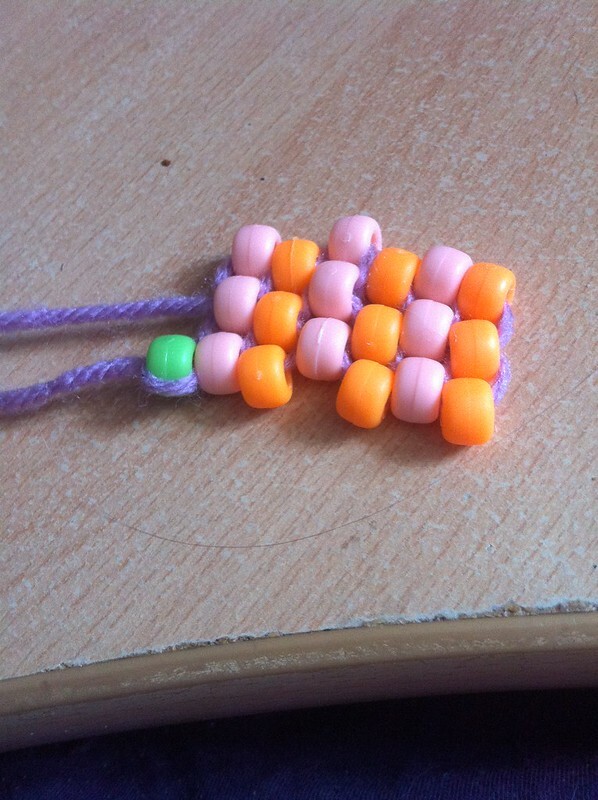 Maybe it’d word a bit better with a 4mm bead? …and I decided I was going to have a go at the one on the bottom left. 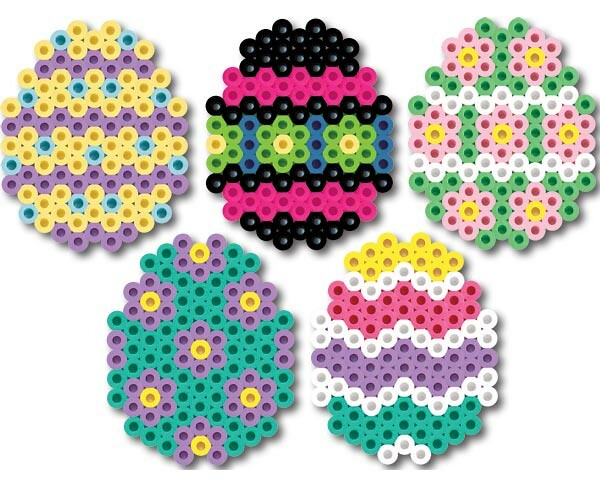 The local bead store runs a contest that doesn’t seem to get a lot of entrants and the theme for the next one is “easter egg”. …and then realised that I didn’t actually know how to shape. Right, so I’ll square it off. Give it a background. Simple. I just needed some pattern paper. Fairly sure I wouldn’t be able to draw one out, I did a google image search and came up with this. Which I uploaded to the doodle app on my iPad and drew a crude pattern on. And off I went. Complete with a tip I found for keeping the base steady, I managed to get half of it done before I got tired and went to bed. Before my next session I did a bit more research into it, looking for tips and advice and things. I discovered a few things. 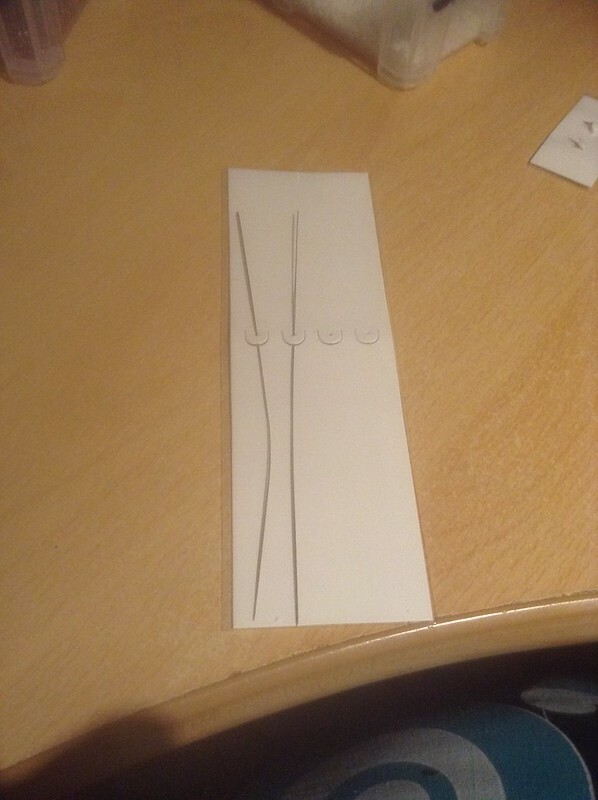 For my first attempt at doing it properly, I picked up some wide eyed beading needles. They’re very odd. I planned to experiment once I’d finished my egg. Which I did in the next session. It looked a wee bit wonky, but I hoped that once I took it off the bottom needle it would even out a bit. Still a little bit wonky, but for my first piece I’m still chuffed. But I am determined that I will not always be doing bead weaving with pony beads. So… on to the big odd needles. I got out my seed beeds, thread some wirey stuff through one of the big needles, and had at it. I failed. There were a couple of problems. The wirey stuff kept sliding out of the needle, and I couldn’t control it much. I decided to resort to my old favourite. Embroidery floss. Not recommended for beading projects usually I don’t think, but it’s something I can manipulate. So I threaded a big odd needle, and got started. I had real trouble with the second row. The beads wouldn’t stay in the right configuration. I wished the knitting needle I’d used for the egg piece would fit in my seed beads, before I recalled that the big odd needles would fit. 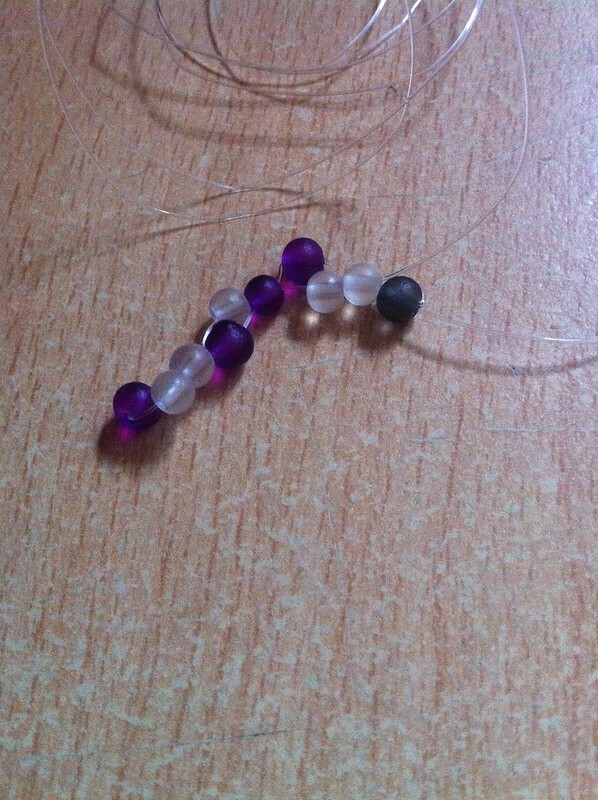 So I threaded one of those through the bottom layer of beads to help stabilise, and I got started again. Next problem, things weren’t staying still! So I got out the cellotape. It’s hard to see the cellotape there, but I’ve taped the needle down. At first I just did each end of the needle, but I was still finding the piece sliding around. So I added more tape, right on the sides of the piece, to keep it still. I worked a few more rows, and found that I was finding it easier. I have the technique down. I KNOW what I’m doing. 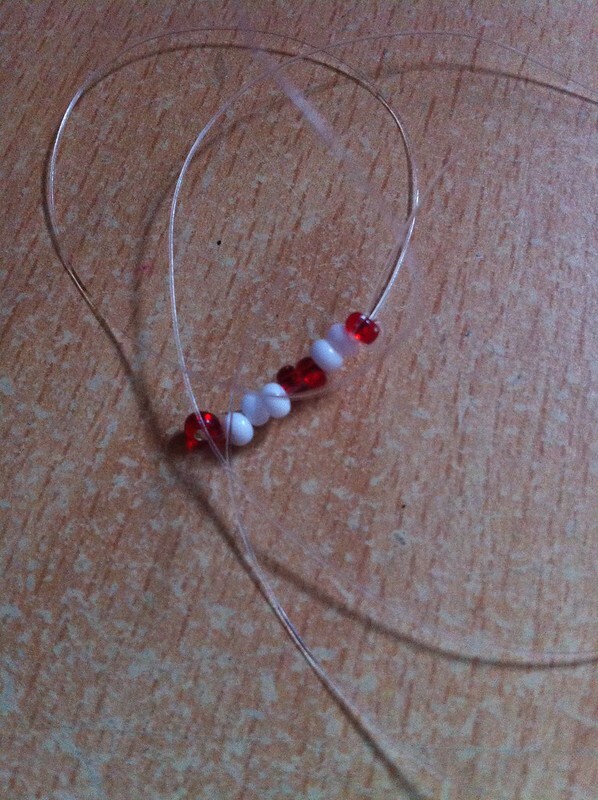 I’m just struggling to do it with such small beads – although the needle really does help. Especially since it’s so bendy. I know though, that the way to get better at something is to practice. You can see at the top of the piece in that last picture that it looks a bit better. Practice practice practice. My tension needs work. The stitch is very loose. But I assume that will come with more practice, just like it did with knitting and crochet. Practice practice practice. As is typical for me, I found this difficult and put it aside to work on something else for a while… and then completely forgot about it. I don’t know where it is now. I’ll have to dig it out, or restart it, and have another go. If I haven’t posted about it in a month or two, chase me up. Disclaimer: This post is a repost from my old blog, which was more personal and less crafty. I don’t use that blog anymore, but thought I’d share some of the craft-related posts from there. This one was from July 2010. The pen is to show how small he is. It was only 16 rows. I had Cayden feed it to me in a few rows a day, so it took a few days, but you could easily make dozens in an evening. 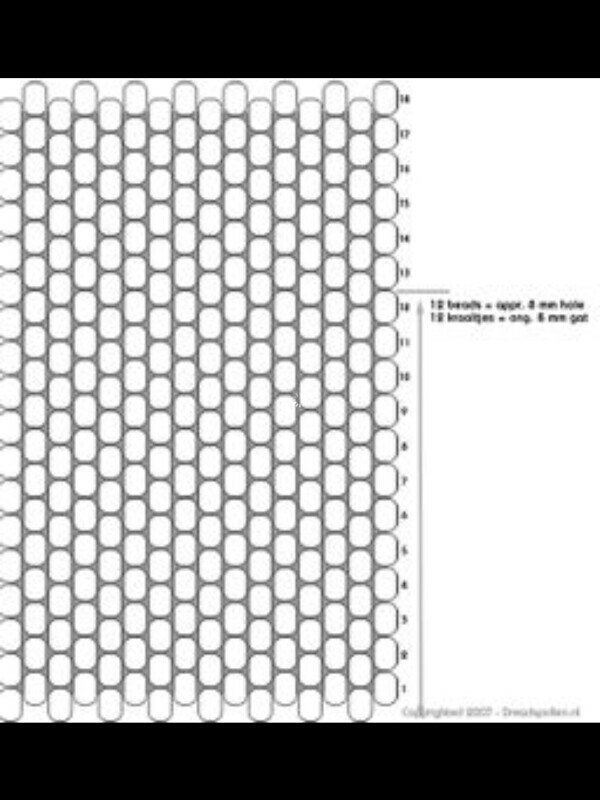 The original pattern can be found here. So what do you think? Isn’t he just the cutest little beastie ever? Since then I’ve made a total of 270 of these guys. So far.